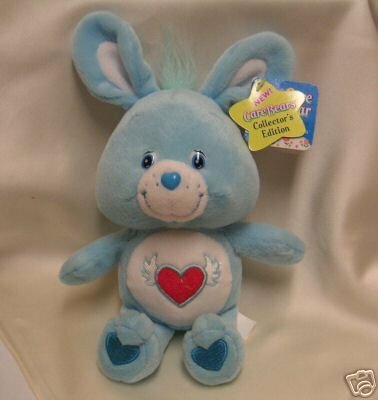 NEW, unused Care Bear Cousin ~~ SWIFT HEART RABBIT ~~ Collector's Edition RARE Plush Beanbag 8" tall. She is light blue with a heart with wings. Helping others always keeps Swift Heart Rabbit hopping. This ninety-miles-a-minute bunny is always hustling, bustling and making happiness happen. Swift Heart Rabbit's symbol is a winged heart. It shows that there is always time to share a smile and good cheer - even when we're busy! Items Similar To "New EASTER Care Bears SWIFT HEART RABBIT 8" Cousin Bunny"